(Cairo) – His Highness Sheikh Mohamed bin Zayed Al Nahyan, Crown Prince of Abu Dhabi and Deputy Supreme Commander of the UAE Armed Forces, and Abdel Fattah el-Sisi, President of Egypt, have discussed the relations between the UAE and Egypt and means of strengthening them, as well as regional and international issues of mutual interest. 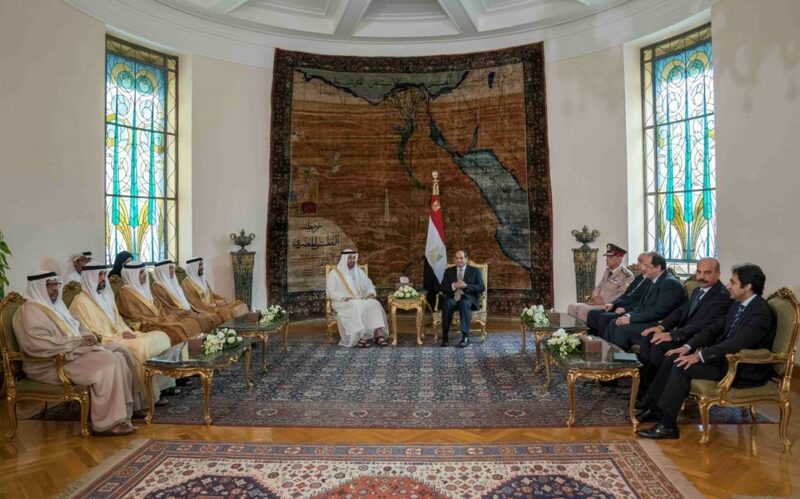 The discussion, which took place as President el-Sisi received His Highness Sheikh Mohamed bin Zayed and his accompanying delegation at the Etihadeya Palace in Cairo, was followed by an expanded session which addressed issues of common concern in more detail. Upon his arrival, His Highness Sheikh Mohamed greeted senior Egyptian officials while el-Sisi greeted his delegation. At the start of their discussions, el-Sisi welcomed H.H. Sheikh Mohamed, expressing Egypt’s regards for the UAE, under the leadership of President His Highness Sheikh Khalifa bin Zayed Al Nahyan. During the meetings, which were attended by H.H. Sheikh Nahyan bin Zayed Al Nahyan, Chairman of the Board of Trustees of the Zayed bin Sultan Al Nahyan Charitable and Humanitarian Foundation, both sides discussed the opportunities to strengthen and develop their bilateral cooperation in the areas of politics, development, the economy and investment, as well as their future prospects, which will answer the ambitions of their peoples, improve their relations, and achieve their strategic interests. Both sides also discussed the latest regional and international developments and their repercussions while exchanging opinions regarding these issues. H.H. Sheikh Mohamed conveyed to el-Sisi the greetings of President His Highness Sheikh Khalifa bin Zayed Al Nahyan and his wishes for further advancement, stability and success to Egypt and its people. He added that the UAE, under the leadership of President His Highness Sheikh Khalifa in Zayed, is keen to constantly communicate with Egypt, to discuss regional matters and support its stability and development. 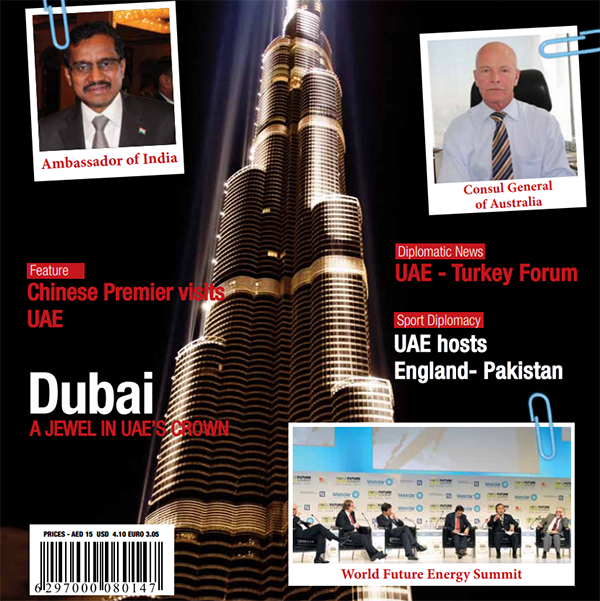 The UAE and Egypt are bound together by well-established strategic relations, whose positive effects are not limited to both countries, but also extend to benefit Arab political stability and security, and economic development, H.H. Sheikh Mohamed further added. H.H. Sheikh Mohamed explained that the relations between the UAE and Egypt are based on trust, mutual respect and solidarity, as well as on their shared visions regarding regional issues and their mutual desire to achieve security, stability and development. Collaboration between the two countries is a major factor in helping the region survive challenges and risks, especially during the current era that is witnessing rapid changes and developments which require constant coordination and discussions among Arab countries, he stressed. H.H. Sheikh Mohamed also underlined the UAE’s desire to support the Arab people and their interests and ambitions, as well as to preserve the stability, peace and development of Arab societies. He further said that the current developments in the Arab region, the Middle East and the entire world require continuous discussions between the leadership of the UAE and Egypt, especially as these developments are closely connected to the national security of the region’s countries. He also stressed that Egypt is a cornerstone of the Arab national security, which is why the UAE is keen to maintain constant communication and discuss all relevant regional affairs with the Egyptian leadership. H.H. Sheikh Mohamed stated that he trusted the ability of the Arab world to regain its stability and balance and counter regional interferences in its affairs, while valuing Egypt’s pivotal role in the Arab world and the region and its wise and balanced policies, under the leadership of President el-Sisi, which will strengthen the Arab nation and serve the Arab people’s interests. President el-Sisi asked H.H. Sheikh Mohamed to pass on his warm regards to President His Highness Sheikh Khalifa, wishing him the best of health and happiness. He also wished the UAE people greater advancement and prosperity, in light of President His Highness Sheikh Khalifa’s wise leadership. He then described the relations between the UAE and Egypt as a model of constructive strategic cooperation, while expressing Egypt’s desire to continue advancing its overall cooperation with the UAE. At the end of their meetings, both sides confirmed their keenness to continue developing their relations and highlighted the importance of strengthening the region’s security and stability and confronting regional interferences. They also underscored the importance of consolidating their regional and international efforts to combat terrorism and extremism, while expressing support for the efforts to reach political solutions to various crises in the region. In attendance were Dr. Anwar bin Mohammed Gargash, Minister of State for Foreign Affairs; Ali bin Hammad Al Shamsi, Deputy Secretary General of the Supreme National Security Council; Mohammed Mubarak al Mazrouei, Under-Secretary of the Abu Dhabi Crown Prince’s Court; and Juma Mubarak Al Junaibi, UAE Ambassador to Egypt. Attending from the Egyptian side were General Mohamed Zaki, Minister of Defense and Military Production; Major General Abbas Kamil, Chief of the General Intelligence; Mustafa Sherif, Chief of the Egyptian President’s Office; and Muhsin Abdel Nabi, Director of the President’s Office.